Lilac is the daughter of the richest man in the universe. Tarver comes from nothing, a young war hero who learned long ago that girls like Lilac are more trouble than they're worth. But with only each other to rely on, Lilac and Tarver must work together, making a tortuous journey across the eerie, deserted terrain to seek help. It only two me two days - two days! 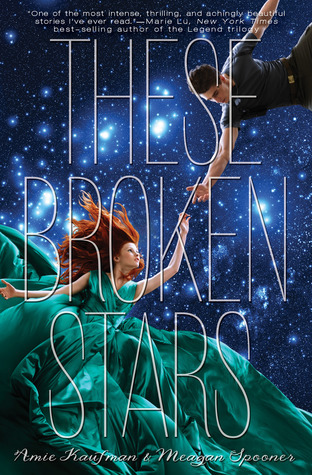 - to listen to the audio book of These Broken Stars. I could not get enough of this story! Lilac and Tarver are traveling through space on Icarus (because man's hubris knows no bounds) - Lilac is the daughter of an exceptionally wealthy merchant and Tarver a Major in the military and a war hero. Through a varying set of circumstances they escape Icarus together and crash land on a nearby planet. Tarver realizes the planet have been terraformed and they begin their trek to find civilization and rescue. But of course that's easier said than done. I love the relationship between Lilac and Tarver. While there was attraction aboard Icarus, the two do not become the best of friends upon impact. Lilac may have been the one to get their pod detached from Icarus before she went down, but Tarver is the one who will get them through the barren wasteland to find help. They are constantly goading each other and it makes for rather enjoyable narration. Lilac's goading is to get under Tarver's skin, but Tarver pushes her button to get her fighting to survive. The character develop is above and beyond. Lilac starts as the spoiled rich girl trapped in her life (Hi, Rose! ), but quickly learns to fend for herself and become a stronger and determined character. She goes from waiting for Daddy to save her to saving herself and Tarver from certain death. While Tarver, a boy from poor family who will never be worthy of someone of Lilac's status (Hi, Jack! ), doesn't have as big a development as Lilac but slowly learns there is more to Lilac then pretty dresses and fancy shoes. Amie and Meagan are amazing writers and I was never able to tell which of the two were writing which scenes. They're detailed in their descriptions, lyrical and beautiful in their prose, and in-depth with their characters. Another thing I really enjoyed is that I was never bored with two characters. We spend 99% of the story with Lilac and Tarver, no one else. It's easy to imagine how an 11 hour 15 minute book with only two characters can be long and drawn out, but the fact that I wanted to remain with only Lilac and Tarver speaks volumes for how well these women write. The audio book was well done as well, relying on Cynthia Holloway for Lilac, Johnathan McClain for Tarver, and Sarge Anton for Tarver's interrogator. These three did an amazing job embodying their characters and conveying their emotions and inflections correctly. Johnathan has such a strong and compelling voice that I could absolutely get lost in his voice. I probably listened to the last chapter (which he narrated) a few times over because the combination of Johnathan's voice and Amie / Meagan's words are spot on. This is a series you need in your life - I know I'm upset at myself for being late to the party - and I cannot wait to get my hands on This Shattered World and Their Fractured Light.